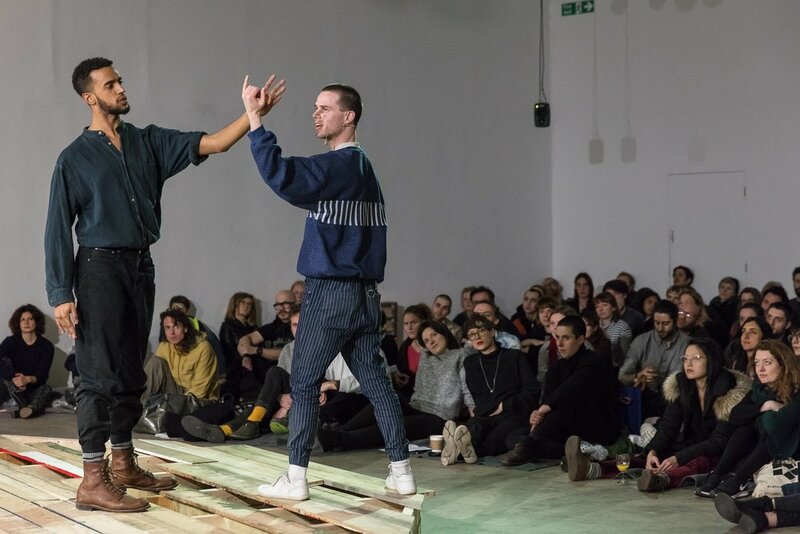 London and Warsaw-based artist and choreographer Alex Baczynski-Jenkins’ work occurs at the intersection of performance and dance, examining queer politics through ideas of desire, intimacy and love. A central part of his work is the use of performance as an agent for what he describes as ‘other-worlding’. Baczynski-Jenkins’ work is dialogic and he develops vocabularies that range from micro-gestures to poems, social dances and their abstractions. These vocabularies pick apart everyday practices that emerge in situations such as friendship and desire. The hole together includes the poem In Me by Ezra Green and takes the tropes of the romantic genre whilst ridding itself of any normative narrative structures or characters. Expressions of care, desire and empathy, lose their usual conventions and representations and are found through micro-gestures, figures of entanglement and dances. Instead of a plot, there is a plotting of an affective field embodied by queer affections that circulate between the performers. Alex Baczynski-Jenkins (born 1987, London) lives and works in Warsaw and London. He is co-founder of feminist and queer project space Kem in Warsaw. He has presented works at the Chisenhale Gallery, London, Palais de Tokyo, Paris, Museum of Modern Art, Warsaw, (all 2017) Swiss Institute Contemporary Art, New York; Muzeum Sztuki, Łódź, (all 2016); David Roberts Art Foundation, London; Block Universe, London; Whitechapel Gallery, London; Cricoteka, Krakow, (all 2015); Basel Liste, Basel (2014) and X-Apartments, Homeworks, Beirut (2013). Baczynski-Jenkins was UK Associate Artist at Delfina Foundation, 2015 and 2016. He was a fellow at the Home Workspace Program, Beirut 2012-2013. The hole together is part of The tremble, the symptom, the swell and the hole together (2017). Photo 1: The hole together episode of The tremble, the symptom, the swell and the hole together (2017). Produced and commissioned by Chisenhale Gallery, London. Courtesy of the artist. Photo 2: The swell episode of The tremble, the symptom, the swell and the hole together (2017). Produced and commissioned by Chisenhale Gallery, London. Courtesy of the artist.